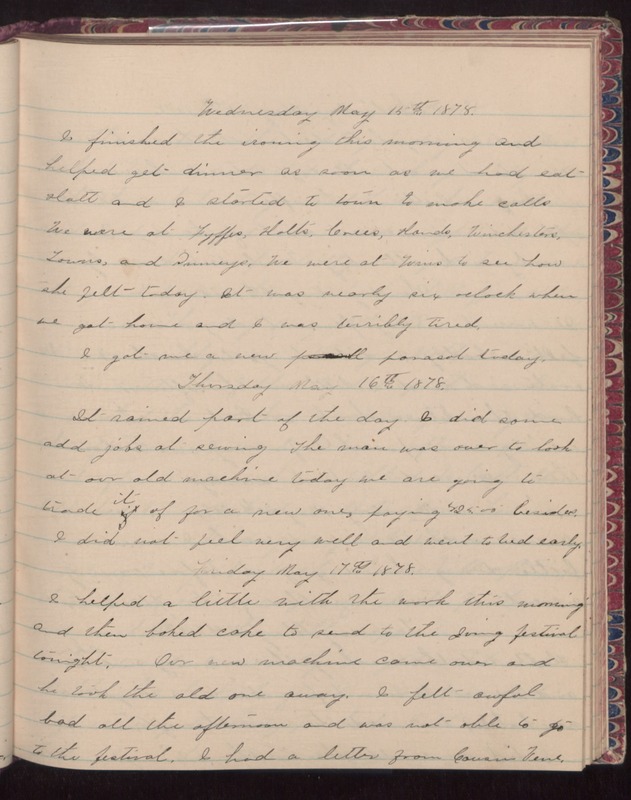 Wednesday May 15th 1878 I finished the ironing this morning and helped get dinner as soon as we had eat. Hatt and I started to town to make calls. We were at Fyffes, Holts, Crees, Hands, Winchesters, [Lowns?] and Prinneys. We were at Wins to see how she felt today. It was nearly six oclock when we got home and I was terribly tired. I got me a new parasol toady. Thursday May 16h 1878 It rained part of the day. I did some odd jobs at sewing. The man was over to old at our old machine today we are going to trade it for a new one paying $25.00 besides. I did not feel very well and went to bed early. Friday May 17th 1878 I helped a little with the work this morning and then baked cake to send to the [illegible] festival tonight. Our new machine came over and he took the old one away. I felt awful bad all the afternoon and was not able to go to the festival. I had a letter from Cousin [Vene? ].